X It shelters itself in its shell, then strikes back with spouts of water at every opportunity. X Il se réfugie dans sa carapace et réplique en éclaboussant l’ennemi à la première occasion. X Se protege con su caparazón y luego contraataca lanzando agua a presión cuando tiene oportunidad. X Si ritira nel suo guscio e, alla prima occasione, contrattacca colpendo il nemico con spruzzi d’acqua. X 등껍질에 숨어 몸을 보호한다. 상대의 빈틈을 놓치지 않고 물을 뿜어내어 반격한다. Y Shoots water at prey while in the water. Withdraws into its shell when in danger. Y Caché sous l’eau, il crache un jet d’eau sur sa proie et se cache à l’intérieur de sa carapace. Y Lanza agua a su presa desde el agua. Se esconde en su concha cuando se siente en peligro. Y Attacca i nemici con potenti getti d’acqua. Se si sente in pericolo si ritira dentro la sua corazza. Y 수면에서 물을 분사하여 먹이를 잡는다. 위험해지면 등껍질에 손발을 감추고 몸을 지킨다. Omega Ruby Squirtle’s shell is not merely used for protection. The shell’s rounded shape and the grooves on its surface help minimize resistance in water, enabling this Pokémon to swim at high speeds. Omega Ruby Schiggys Panzer dient nicht nur zum Schutz. Die runde Form und die Furchen auf der Oberfläche verringern den Widerstand im Wasser, sodass dieses Pokémon sehr schnell schwimmen kann. Omega Ruby La carapace de Carapuce ne sert pas qu’à le protéger. La forme ronde de sa carapace et ses rainures lui permettent d’améliorer son hydrodynamisme. Ce Pokémon nage extrêmement vite. Omega Ruby El caparazón de Squirtle no le sirve de protección únicamente. Su forma redondeada y las hendiduras que tiene le ayudan a deslizarse en el agua y le permiten nadar a gran velocidad. 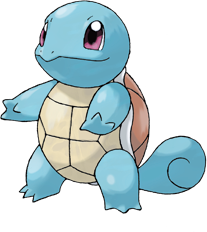 Omega Ruby La corazza di Squirtle non serve soltanto da protezione. La particolare forma arrotondata e le scanalature superficiali lo aiutano a minimizzare l’attrito dell’acqua per nuotare ad alta velocità. Omega Ruby 등껍질의 역할은 몸을 지키는 것뿐만이 아니다. 둥그런 모양과 표면의 홈이 물의 저항을 줄여서 빠르게 헤엄칠 수 있다. Alpha Sapphire Squirtle’s shell is not merely used for protection. The shell’s rounded shape and the grooves on its surface help minimize resistance in water, enabling this Pokémon to swim at high speeds. Alpha Sapphire Schiggys Panzer dient nicht nur zum Schutz. Die runde Form und die Furchen auf der Oberfläche verringern den Widerstand im Wasser, sodass dieses Pokémon sehr schnell schwimmen kann. Alpha Sapphire La carapace de Carapuce ne sert pas qu’à le protéger. La forme ronde de sa carapace et ses rainures lui permettent d’améliorer son hydrodynamisme. Ce Pokémon nage extrêmement vite. Alpha Sapphire El caparazón de Squirtle no le sirve de protección únicamente. Su forma redondeada y las hendiduras que tiene le ayudan a deslizarse en el agua y le permiten nadar a gran velocidad. Alpha Sapphire La corazza di Squirtle non serve soltanto da protezione. La particolare forma arrotondata e le scanalature superficiali lo aiutano a minimizzare l’attrito dell’acqua per nuotare ad alta velocità. Alpha Sapphire 등껍질의 역할은 몸을 지키는 것뿐만이 아니다. 둥그런 모양과 표면의 홈이 물의 저항을 줄여서 빠르게 헤엄칠 수 있다. Red After birth, its back swells and hardens into a shell. Powerfully sprays foam from its mouth. Blue After birth, its back swells and hardens into a shell. Powerfully sprays foam from its mouth. Yellow Shoots water at prey while in the water. Withdraws into its shell when in danger. Stadium It takes time for the shell to form and harden after hatching. It sprays foam powerfully from its mouth. Gold The shell is soft when it is born. It soon becomes so resilient, prodding fingers will bounce off it. Silver The shell, which hardens soon after it is born, is resilient. If you poke it, it will bounce back out. Crystal When it feels threatened, it draws its legs inside its shell and sprays water from its mouth. Stadium2 The shell is soft when it is born. It soon becomes so resilient, prodding fingers will bounce off it. Ruby Squirtle's shell is not merly used for protection. The shell's rounded shape and the grooves on its surface help minimize resistance in water, enabling this pokemon to swim at high speeds. Sapphire SQUIRTLE's shell is not merely used for protection. The shell's rounded shape and the grooves on its surface help minimize resistance in water, enabling this POKeMON to swim at high speeds. Emerald Its shell is not just for protection. 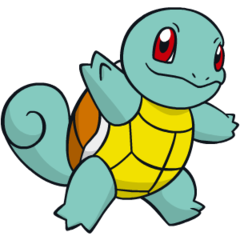 Its rounded shape and the grooves on its surface minimize resistance in water, enabling SQUIRTLE to swim at high speeds. Pearl It shelters itself in its shell, then strikes back with spouts of water at every opportunity. Platinum It shelters itself in its shell, then strikes back with spouts of water at every opportunity. Black It shelters itself in its shell, then strikes back with spouts of water at every opportunity. White It shelters itself in its shell, then strikes back with spouts of water at every opportunity. White 2 It shelters itself in its shell then strikes back with spouts of water at every opportunity.